Learn about how GDPR affects the Zipify Pages app and the steps we've taken for compliance! The General Data Protection Regulation is a law that gives residents of the European Union (EU) and the European Economic Area (EEA) more control over their personal data and seeks to clarify rules and responsibilities for online services with European users. The regulation expands the scope of what companies must consider personal data, and it requires them to closely track the data they've stored on EU and EEA residents. If someone in the EU or EEA wants a company to delete his or her data, send copies of the data, or correct an error in the data, companies have to comply. How can I ensure that my Optin Forms used in Zipify Pages are compliant? We have added in a "GDPR Notification" section to both our lightbox popup optin form as well as our on-page optin form. This includes a GDPR Checkbox and GDPR Message to collect consent from EU and EEA visitors to store their data. Default text is provided. Use this field to add your own text for the GDPR checkbox message if desired. The GDPR Notification section and checkbox is enabled by default for all forms. If Enabled, this checkbox and message will only show on forms for visitors which are detected as being from countries belonging to the European Union (EU) and the European Economic Area (EEA) based on IP address. 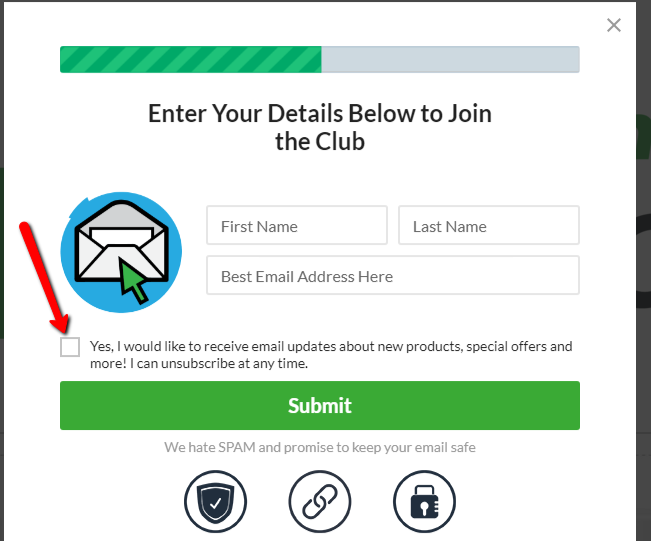 If this checkbox is not clicked, the visitor will not be able to proceed with opting in to the form and your mailing list. For the "On-Page Optin Form" block (CTAs section of page blocks) the GDPR Notification section can be found in the Form Options > GDPR Notification settings section when editing the button in that block. Where will the GDPR Checkbox and Message be shown to my visitors on the optin forms? The GDPR Checkbox and Message will be shown directly below the email address field on the optin forms. This placement is important since it's required to collect consent from EU and EEA visitors to store their data prior to opting in.